No Log-in, No Membership registration. Just install and run. You can find the people who has same favorite things with you. 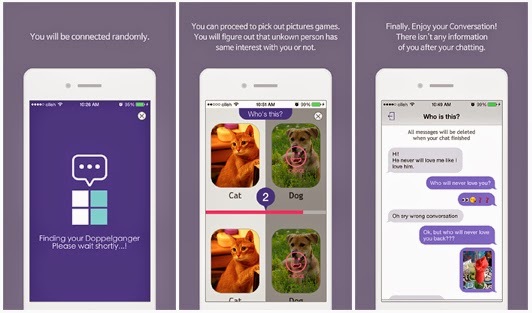 Run the app and wait a moment, you can proceed to pick out pictures game. Through the pick out pictures game to make sure the taste of each other. If you pick out same sports, same food, same season with mystery person, will be able to chat. You can go in more detail with each other via a conversation with an unknown opponent. You can send and receive pictures and unknown opponent. Member registration is not required. It does not remain the contents of the conversation.